The "Order of the Arrow" is the honor society of the Boy Scouts of America, intended to recognize older scouts in their teens who best exemplify the scout virtues of cheerful service, camping, and leadership. As one of the largest and most outstanding youth programs of the past century in the United States, the Order of the Arrow's history, purposes, and membership requirements merit this introduction. Founded in 1915, just seven years after the acclaimed English war hero Robert Baden-Powell started scouting in Great Britain, the "OA's" origin and development are tightly intertwined, like a well-made square knot, with scouting itself in the United States. Its history is a remarkable saga of a good-hearted visionary's lasting effect on generations of American youth. The new scout movement was enjoying halcyon days in an America still at peace in 1915, while young men in Europe were dying by the thousands in a war more terrible than any before in history. Boys in the U.S. seemed to be donning scout uniforms everywhere as membership grew rapidly from coast to coast. Prominent businessmen, civic and religious groups, and politicians, including Congressmen and the President, vied to match the enthusiasm of boys surging into scout camps across the nation, eager to be part of the great wave of scouting which had reached American shores in the years before World War I. As E. Urner Goodman, then a 25 year old scoutmaster, walked along Walnut Street in downtown Philadelphia, PA, in May, 1915, he undoubtedly heard newsboys hawking the Philadelphia "Inquirer's" headlines, blaring the sinking of the Cunard ocean liner "Lusitania" from a U-boat torpedo attack within sight of the Irish coast. Young Urner was busy with plans that would also have far reaching effects, for he had agreed to take the job of Camp Director at the Philadelphia scout council's camp perched on idyllic Treasure Island in the Delaware River. What he had in mind was to leave a lasting imprint on thousands of American youth in the twentieth century and into the 21st century. Urner's thoughts in 1915 were focused on development of methods to teach the scouts attending summer camp that skill proficiency in Scoutcraft was not enough; rather, the principles embodied in the Scout Oath and Law should become realities in the lives of Scouts. As a means of accomplishing this without preaching and within a boy's interest, he decided to launch an innovative program that summer based on peer recognition and the appeal of Indian lore. Troops would choose, at the conclusion of camp, those boys from among their number best exemplifying these traits, who would be honored as members of an Indian "lodge". Boys so acknowledged in the eyes of their fellow scouts would form a fraternal bond joined together in a richly symbolic brotherhood. Assistant Camp Director Carroll A. Edson helped Urner research the lore and language of the Delaware Indians who had inhabited Treasure Island, which they combined with characters from James Fenimore Cooper's "Last of the Mohicans", to develop dramatic induction ceremonies for the "Order of the Arrow", as the fledgling honor society was soon dubbed. Both Goodman and Edson were Masons, and thus it is not surprising that a certain similarity between some aspects of OA and Masonic ceremonies is also apparent. Even today, these rites make a lasting impression on scouts who have been elected to the "Order of the Arrow". By 1921, the idea had spread to a score of scout councils in the northeast U.S. and the first national gathering of the Order of the Arrow was held. A few other scout councils scattered around the nation started their own local versions of ceremonial scout honor societies in the 1920's and 1930's, called by various other names. 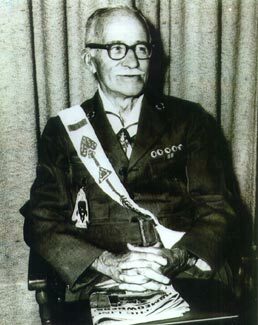 Although the OA and similar scout honor societies were initially viewed with suspicion by some scouters as secretive, if not an affront to the egalitarian ideals of scouting, legendary Chief Scout Executive James E. West permitted those councils desiring Order of the Arrow lodges to establish them as an "experimental" program under a "National Lodge". Not until the 1940's was E. Urner Goodman's innovation completely accepted as part of the national scouting program and found in a majority of councils nationwide. Having observed its Diamond Anniversary in 1990, membership in the Order had grown to 160,000 of the more than one million eligible Boy Scouts in the U. S., organized into almost 400 lodges nationwide. Rare indeed is the council today that does not have an Order of the Arrow lodge with its own Indian name and "totem", or emblem. It is evident that the Order of the Arrow has made a significant contribution to Scouting, as we know it today in the United States. The OA's motto, "Brotherhood of Cheerful Service", is more than just an empty slogan for many Arrowmen, who constitute a valuable council resource for camp promotion, improvement projects, and summer camp staff. The OA, at its best, continues to be a powerful teaching tool for Scouting ideals. The OA helps in retaining older boys in Scouting, who otherwise often tend to lose interest upon reaching high school age. Notably, OA guidelines place great importance on preserving Lodge leadership in the hands of its youth members, headed by a Chief, Vice Chief(s), and an Executive Committee, all of whom must be under age 21, who plan and implement Lodge activities, service projects, ceremonies, publications, budgets, and conduct troop elections as arranged with Scoutmasters. In larger councils, lodges are often sub-divided into "chapters", with youth chapter officers and committeemen running chapter events. At the Section, Regional, and National levels, Chiefs and Vice-Chiefs are typically young men of college age, since Arrowmen are considered youth members until age 21. Adults are also important to the OA's success as advisors and resources, such as transportation, service project skills, and the like. Many adult scouters find participation in the OA to be rewarding, as they help kindle anew the spirit of brotherhood in scouting's honor society. Participate in the "Ordeal" and induction ceremony, after election by his Boy Scout troop or Varsity unit. Each Scout troop may schedule an Order of the Arrow election once annually. 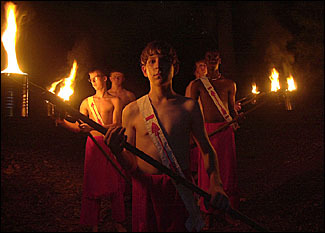 In many Councils, these elections are held at summer camp, in line with the traditions of the OA's founding. All registered active youth troop members have a vote, both current Arrowmen and non-Arrowmen. Membership selection is thus predominantly by non-members. Co-ed Explorer posts or Venture crews cannot have OA elections, thus girls are not eligible for OA membership. A boy in a Venture Crew or Explorer post who has dual registration with a Scout troop (or Varsity unit) is, of course, eligible for election by his troop or Varsity unit. Adult scouters, both men and women, may be proposed for membership in the Order of the Arrow by unit or district committees or the Lodge. Once selected, they, too, undergo the "Ordeal" and participate in the induction ceremonies. "The induction is not a hazing or an initiation ceremony. The Order is not a secret Scout organization, and its ceremonies are open to any parent, Scout leader, or religious leader. There is an element of mystery in the ceremonies for the sake of its effect on the candidates. For this reason, ceremonies are not put on in public. The ceremonies...are not objectionable to any religious group." Following 10 months as an "Ordeal" member, the Arrowman may participate in the "Brotherhood" ceremony, which signifies the sealing of his membership and an additional emphasis on OA ideals and purposes. After an additional 2 years have elapsed, exceptional Arrowmen may be recognized by conferring of the "Vigil Honor". Generally speaking, only two percent of the Lodge membership may be selected each year for this highest of Lodge honors. A special ceremony, devised by Dr. Goodman in 1915 and closely based on ancient Indian traditions, culminates this experience. All Order of the Arrow members are reminded that their primary duty always remains to their own troop, which elected them in the first place as a result of their cheerful service to their fellow unit members. OA Lodge activities are intended to supplement, and not replace, troop activities. Probably the single most often-heard complaint directed towards the OA program is that of Arrowmen who have forgotten this cardinal principle. OA Lodges meet with other lodges in their sections each year and attend a nationwide gathering held on the campus of a major university every two years. These National Conferences, as they are called, feature individual and Lodge competitions in ceremonies, Indian dancing and costumes, and sports, along with seminars and gala arena shows. Thousands of Arrowmen attend, which for many is an exciting highlight of their scouting experience on a par with a National Jamboree. For more than a half century after founding the Order of the Arrow, E. Urner Goodman continued to be a towering figure in American scouting, attaining a doctorate in education and serving for many years as National Program Director of the BSA, all the while steadfastly devoted to the OA. He and his wife enjoyed hosting visiting Arrowmen at his "Order of the Arrow Brotherhood Barn" home in Vermont and he also attended events held by Unami Lodge #1 in Philadelphia and various Section Conferences in the 1960's and 1970's. In retirement, he moved to Florida but continued to correspond personally with many Arrowmen, including this writer. Dr. Goodman's keynote speeches were a traditional and inspiring highlight of OA National Conferences, until his final appearance in 1979 at Colorado State University, just six months before his death in March, 1980, at age 89. He was hailed by the 4,300 Arrowmen present with a thunderous standing ovation. He spoke movingly of his creation of the OA as a "Thing of the Spirit" in that place ... so distant in time ... on the misty shores of the Delaware River. He bade us farewell, there in the shadows of the snow-capped Rockies, with a memorable peroration to keep the OA's flame of fellowship glowing brightly in our hearts. Though a frail, elderly man stood before us, stooped with age, yet the spirit borne within would truly live on in our hearts, firm bound eternally in youthful brotherhood, wherever men strive to love and serve one another. � 1991, 2005 Atlas Communications, PO Box 5534, Baltimore, MD 21285. All rights reserved. No part may be reproduced without written permission.